Time is money! Nowhere is this truer than on construction sites. Maneuvering around the site, unexpected delays caused by excavator and wheel-loader accidents or breakdowns – all this costs time and hence also money. “We take a machine that weighs several tons and maneuver it with millimeter accuracy, eight hours a day. Even the tiniest detail has to be right,” says the wheel-loader operator Roland Ehrensberger. That is why, at this year’s bauma trade show, Bosch is presenting a driver’s cab developed especially for construction machinery. At this driver workplace of the future, vehicle operating data can be analyzed to the nearest second on a tablet display. And that is not all: ultrasonic and video sensors monitor the vehicle’s surroundings more thoroughly than any rear-view mirror, which prevents downtimes due to accidents. These surround sensors are an important step in the process of giving construction vehicles more intelligence, and so making them even safer. “Bosch is turning construction machinery into technology showpieces,” says Johannes-Jörg Rüger, president of Bosch’s newly founded Commercial Vehicle & Off-Road unit. 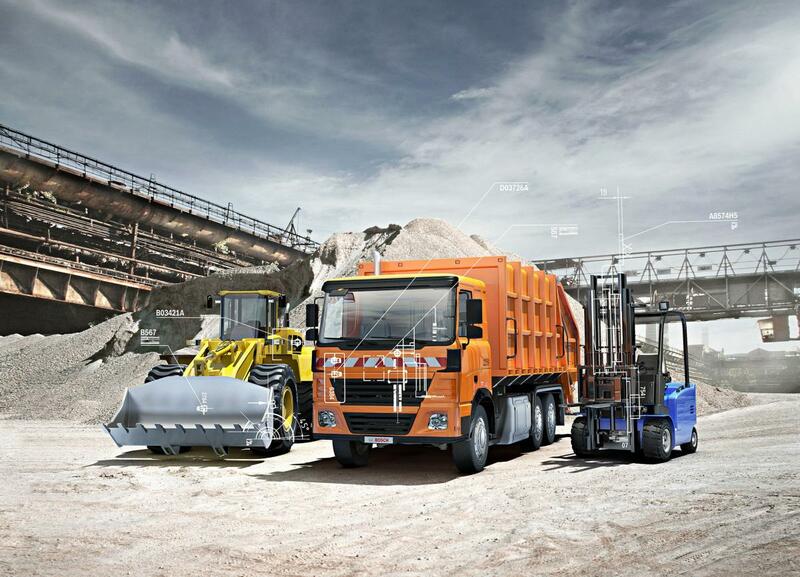 “The megatrends of automation, electrification, and connectivity don’t stop at the gates of construction sites or mines.” In the future, construction machinery will automatically carry out certain tasks, with drivers scheduling tasks at the connected interface in their cab. Bosch is presenting systems solutions for construction machinery for the first time at bauma 2016. At the start of the year, the supplier of technology and services set up a unit specifically for this field. “As a systems supplier, we want to offer everyone the solution they need,” Rüger says. The unit’s portfolio comprises all the Bosch products and services that are relevant for construction machinery: “Modern sensor systems, cameras, and display technology improve the driver’s workplace, as well as increasing safety and hence also productivity,” explains Andrew Allen, head of the unit’s Construction business. Bosch has worked with partners to integrate its products into a futuristic driver’s cab. The newly founded Cab Concept Cluster project brings together a network of renowned suppliers, the Technische Universität Dresden, and VDBUM, the German association for construction, environmental, and machine technology. The project’s aim is to demonstrate to manufacturers of construction machinery, agricultural machinery, and industrial forklifts how much potential there is for efficient system integration. This concept has already notched up its first success: the Genius CAB driver’s cab won the bauma innovation award in the Design category. Which individual components go into the Bosch driver’s cab? The body computer is the central element in the electronic concept. It reduces the number of electrical connections, relays, and fuses. This not only saves on material but also makes circuits less complex, which in turn greatly reduces error rates. The body computer’s programming can be customized to suit each customer’s applications. In the Genius CAB, the body computer performs central control of the sensor and actuator systems via CAN (J1939), LIN, or directly. The Bosch direct wiper drive adjusts effortlessly to the prevailing weather conditions – whether snow, showers, or hard rain. What is more, the wiper drive can be flexibly adjusted to fit different cabs. Bosch side-view mirror replacement displays give drivers a digital look over their shoulder. Integrating the displays into the vehicle interior means there is no need for side-view mirrors. Particularly in the working environment of a construction site, reducing blind spots significantly increases workplace safety. An ultrasonic sensor system can monitor the environment when human eyesight is not enough – when visibility is poor, for example, or even at night. These sensors give drivers unobstructed all-round vision, which further heightens operating safety. The display shows drivers any obstacles, so they can react accordingly. Measurement ranges can be defined individually for each sensor. The central user interface in the Genius CAB is the DI4-mid display and terminal, which can be operated using buttons or via the touchscreen. With a 7-inch display, the DI4 is a universally applicable control system that is freely programmable using the Codesys V3.5 development environment. Another interface is the 4THE5 joystick. In excavators, this controls functions such as shovel movements. At the same time, the joystick is an important interface to the DI4-mid terminal, since its push buttons can be used to activate terminal functions including the windshield wipers, side-view mirror replacement system, and cab lighting.